Eugenio María de Hostos Community College (CUNY) was established in response to CUNY’s enactment of Open Admissions in 1969, which guaranteed admission to one of the City’s system of colleges to city residents who had a high school diploma, or its equivalent. This led almost immediately to a doubling of enrollment at these institutions. Hostos—which was initially located on the southwest corner of East 149th Street and the Grand Concourse, in the heart of the South Bronx’s overwhelmingly Latino and African-American communities— first offered classes in the fall of 1970. Latino leaders demanded a school that would meet the educational, social, and cultural needs of the South Bronx community. In view of the extremely high percentage of Spanish-speaking residents and their bilingual children in the South Bronx, Hostos became the sole bilingual college in the New York City tristate area. The college pioneered in instituting educational initiatives responsive to its students’ needs. The naming of the college for the educator Eugenio María de Hostos (1839-1903): A Puerto Rican Renaissance man, who advocated for education for women, the abolition of slavery, and independence for Puerto Rico signaled the progressive intent of the college’s founders. However, Hostos’ auspicious beginning was marred by its woefully inadequate facilities, that consisted of a single, five-story edifice repurposed from an abandoned factory. During the 1970s, from the fall of 1973 until the spring of 1979, the Save Hostos Movement became one of the most prolonged and successful mass movements in New York City. Over that five-year period, students, staff, faculty, and members of the community mobilized three massive year-long campaigns, each of which accomplished its goal. • From Sept. 1973 to June 1974: “Hostos Needs Space,” a coalition of the Professional Staff Congress (PSC) and the Student Government Organization (SGO), mobilized the Hostos community to obtain the 500 Building, a recently constructed, five-story building on the southeast corner of East 149th St. and the Grand Concourse, that had housed an insurance company. This coalition accomplished its goal by enlisting the Bronx State Senator and State Assemblyperson representing the South Bronx to convince the New York State Legislature’s Black and Latino Caucus to introduce legislation that allocated funds for that purpose. 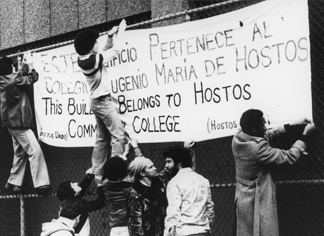 • From Sept. 1975 through June 1976: The “Save Hostos Committee,” an officially designated body of the Hostos Senate, and the PSC, together with the “Hostos Coalition to Save Hostos,” successfully mobilized the campus and community to prevent the closing of Hostos Community College. In addition to the employment of a full array of political tactics, members of the Community Coalition occupied Hostos’ main building until the police intervened and arrested forty students and faculty members. • From Sept. 1977 to June 1978: “Hostos United/Hostos Unido,” brought together the forces that had previously supported the Save Hostos Committee and the Community Coalition to Save Hostos to carry out a massive campaign to obtain funding to reconfigure the former office building for educational use. When these tactics seemed inadequate to obtain the campaign’s goal, a very large contingent of students and many faculty occupied the 500 Building for three months, where classes were held. This four-month long occupation persisted until the announcement came from the Office of the Mayor of New York that bonds for the reconstruction of the edifice had been approved. The Save Hostos Movement brought together a wide range of organizations: the Hostos Chapter of the Professional Staff Congress, the Student Government Organization, many student clubs, including the Federación Universitarios Socialistas Puertorriqueños, the Dominican Club, the Puerto Rican Club, the Black Student Union, the Veterans’ Club, and the Christian Club. In addition, faculty and student leaders established organizations—such as Hostos Needs Space, the Save Hostos Committee, the Community Coalition to Save Hostos, and Hostos United/Hostos Unido—specifically for the purpose of saving Hostos. 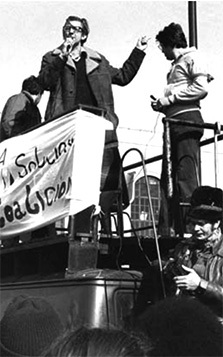 The success of the Save Hostos Movement depended upon its use of a combination of tactics that effectively politicized the campus and attracted widespread support from the residents of the communities Hostos served. The willingness of those within and outside the Hostos campus to commit themselves to this movement, and in some instances risk arrest, reflected the degree to which Hostos embodied a concrete achievement for these communities in their fight against discrimination in general, and for bilingual education. The successes of the three campaigns that comprised the Save Hostos Movement left a deep impression on the culture of the college. Subsequent organizations—such as the Hostos Solidarity Coalition, the Hostos Action Coalition, and the Hostos AIDS Task Force—employed similar forms of organizational forms utilizing an array of tactic to achieve educational, cultural, and political goals. This collection—through letters from faculty and students to elected officials, student newspapers, PSC Chapter Newsletters, meeting minutes of activist groups, photographs of demonstrations, and fliers designed by campus and community supporters of Hostos Community College—tells the story of the three campaigns that comprise the Save Hostos Movement. Curated by Gerald Meyer, a faculty member at Hostos since 1972, this collection presents just some of the hundreds of items he amassed during the Save Hostos Movement from 1973 to 1978 while serving as PSC Chapter Chairperson. Meyer's additional holdings can be found in a larger, self-titled collection housed in the archives of Hostos Community College. Gerald Meyer is the author of Vito Marcantonio: Radical Politician, co-editor of The Lost World of Italian American Radicalism, and author of eighty articles and reviews on a wide range of topics. He serves on the editorial boards of Science & Society and Socialism and Democracy and also serves as Co-Chair of the Vito Marcantonio Forum. Go to all 65 Items in collection.